138 Beacon is located on the north side of Beacon, between Berkeley and Clarendon, with 136 Beacon to the east and 140 Beacon to the west. 38 Beacon was designed and built by architect Charles Kirby, one of two contiguous houses (136-138 Beacon), designed as a symmetrical pair. They were originally numbered 118 Beacon and 119 Beacon, but re-numbered as 136 Beacon and 138 Beacon ca. 1862 when homes were built on the south side of the street. 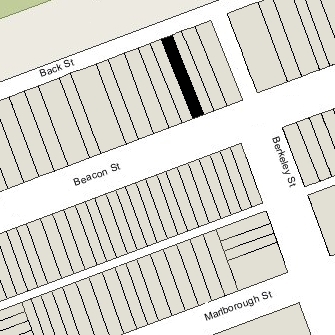 Charles Kirby bought the land for 136-138 Beacon on March 31, 1859, from the Boston and Roxbury Mill Corporation. Click here for an index to the deeds for 138 Beacon. On January 4, 1860, 136-138 Beacon were purchased from Charles K. Kirby by Eliza Gill (Bradlee) Winchester, the widow of William Parsons Winchester. She lived at 136 Beacon and her son and daughter-in-law, Thomas Bradlee Winchester and Ellen Doane (Manson) Winchester, lived at 138 Beacon. Thomas and Ellen Winchester previously had lived in Charlestown. Thomas Winchester was a member of the wholesale merchant firm of E. A. & W. Winchester, founded by his grandfather, which dealt in soaps, candles, and other provisions, and were the manufacturers of Winchester soap. Eliza G. Winchester died in September of 1890. In her will, she left the residue of her estate – including 138 Beacon – to her five surviving children — Mary Bradlee Winchester, Eliza Gill Bradlee Winchester, Emily Ann Bradlee Winchester, Ellen Lousa Bradlee Winchester, and Thomas Bradlee Winchester — in trust during their lifetimes. The will provided that upon the death of each child, his or her share of the principal was to be distributed to his or her children. Eliza Gill Bradlee (Winchester) Taylor of Baltimore, the widow of Henry Schroeder Taylor, died in April of 1896 and her one-fifth share of 138 Beacon was distributed on September 19, 1896, to her four children. Mary Bradlee (Winchester) Cunningham, the widow of George Inman Cunningham, died in March of 1899, and her one-fifth share of 138 Beacon was distributed on April 1, 1899, to her daughter, Mary Winchester (Cunningham) Barnard of Mattapoisett, the widow of Joseph Tilden Barnard. Thomas and Ellen Winchester continued to live at 138 Beacon. Ellen Winchester died in July of 1901, and Thomas Winchester died in March of 1904. On February 23, 1905, 138 Beacon was purchased from the heirs of Eliza Winchester by Arthur Theodore Lyman, a cotton manufacturer and wholesale merchant. A widower, he lived at 39 Beacon and in Waltham. 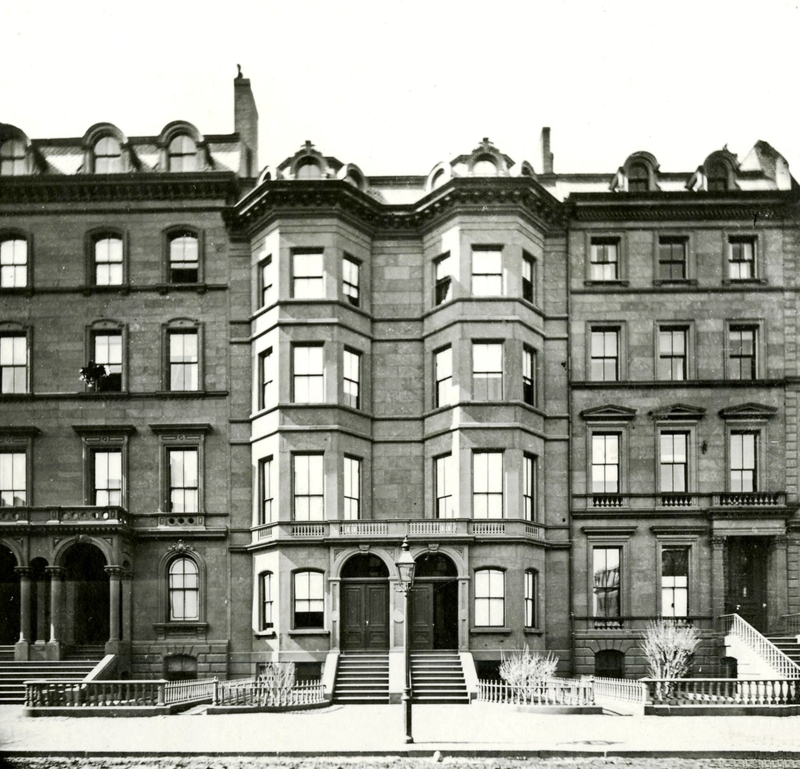 138 Beacon became the home of Arthur Lyman’s son and daughter-in-law, Ronald Theodore Lyman and Elizabeth Van Cortlandt (Parker) Lyman, who had married in October of 1904. They also maintained a home in Waltham with his father. Ronald Lyman was a manager in the cotton mills operated by his father. He later became treasurer of the Waltham Bleachery and Dye Company (succeeding his father) and treasurer of various other textile manufacturing companies. 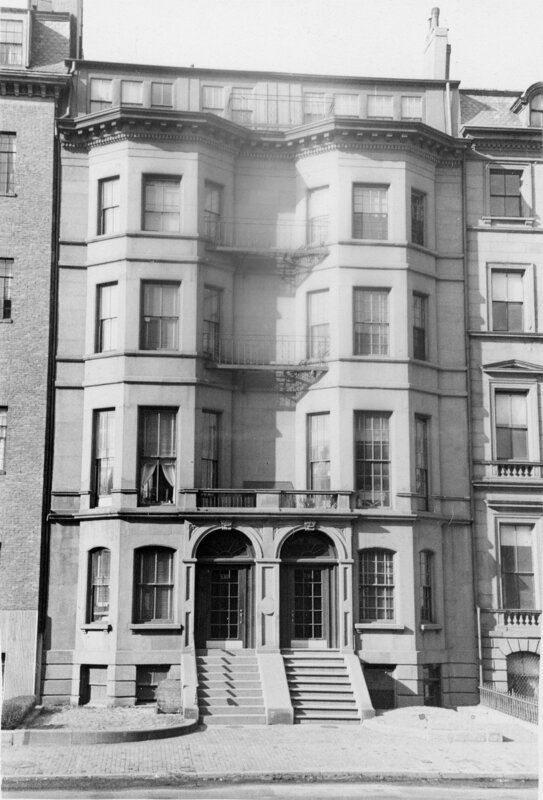 Arthur Lyman died in October of 1915, and Ronald and Elizabeth Lyman moved soon thereafter from 138 Beacon to his father’s former home at 39 Beacon. In March of 1917, Arthur Lyman’s estate made 138 Beacon available to the Metropolitan Chapter of the American Red Cross for use by its educational department, which previously had been located at 91 Newbury. They remained there for about one year. On May 27, 1918, 138 Beacon was purchased from the Lyman estate by Marie Alexis (Hayes) Sturges, the widow of Walter Knight Sturges, and their three sons: Thomas Rush Sturges, Hayes Sturges, and Walter Knight Sturges, Jr. They previously had lived at 288 Beacon. Walter Sturges had been a banker and then, from 1901 until his death in May of 1913, had been agent for the estate of his grandfather, Benjamin Brayton Knight, in Providence. Marie Sturges and her sons continued to live at 138 Beacon during the 1902-1921 winter season, but were living elsewhere for the next two seasons. During the 1921-1922 and 1922-1923 winter seasons, 138 Beacon was was the home of Benjamin Helm Bristow Draper, a manufacturer of cotton mill machinery, and his wife, Queena (Sanford) Draper. They also maintained a home in Hopedale. They moved to 75 Mt. Vernon for the next season, and by the 1924-1925 season they were living at 187 Beacon. By the 1923-1924 winter season, Marie Sturges had resumed living at 138 Beacon. She continued to live there during the next season, but moved thereafter to an apartment at 282 Beacon. On September 25, 1925, 138 Beacon was acquired from Marie Sturges by Dr. Harry Winfred Goodall and his wife, Emma Cornelia (Moore) Pierce Goodall. Living with them were Edward Winslow Pierce, II, and Pollie Adams Pierce, Emma Goodall’s children by her previous marriage to coal dealer Winslow Claflin Pierce, who had died in 1920. Harry Goodall and Emma Pierce had married in 1925 and 138 Beacon probably was their first home together. Harry Goodall was a physician and maintained his offices at 205 Beacon. In November of 1925, Dr. Goodall applied for (and subsequently received) permission to construct a two car garage behind 138 Beacon. Henry and Emma Goodall, Edward Pierce, and Pollie Pierce continued to live there in 1927. By the 1927-1928 winter season, they had moved to 1 Raleigh. In December of 1927, Pollie Pierce married to Richard Leland Thompson. 138 Beacon was not listed in the 1928-1937 Blue Books and was shown as vacant in the 1930-1936 City Directories. Harry Goodall died in April of 1935, and in November of 1935, his estate applied for (and subsequently received) permission to convert 138 Beacon from a single-family dwelling into ten apartments, including removing a rear ell (probably the garage approved in 1925). At about the same time, the owners of 136 Beacon also converted their property into ten apartments. As part of the remodeling of both houses, the original dormers were removed and the fifth floor expanded and modernized. Plans for remodeling the houses, prepared for real estate dealer Overton W. Oglivie by John J. Mahoney, civil engineer, are included in the City of Boston Blueprints Collection in the Boston Public Library’s Arts Department (the reference for 136 Beacon is BIN P-134 and the reference of 138 Beacon is BIN P-131). On May 18, 1944, Harry Goodall’s estate transferred 138 Beacon to Pollie (Pierce) Thompson and Edward Pierce, II. On April 27, 1947, 138 Beacon was acquired from Pollie Thompson and Edward Pierce by real estate dealer Howard S. Cosgrove, and on May 17, 1948, it was acquired from him by the Myrtleside Realty Company, Inc. In April of 1955, it acquired 136 Beacon. In August of 1963, 136 Beacon was acquired from Paul and Dorcas Amon by John V. Kunigenas. The Amons retained 138 Beacon. Paul Amon died in May of 1967 and on February 2, 1970, John Kunigenas purchased 138 Beacon from Dorcas Amon. On June 29, 1973, 136 Beacon and 138 Beacon were acquired from John Kunigenas by Anthony P. Baker, general partner of Bay Associates Limited Partnership II. On July 2, 1976, John Kunigenas foreclosed on his mortgage to Anthony Baker and took possession of both properties. On August 22, 1979, 136 Beacon and 138 Beacon were purchased from John Kunigenas by the Broderick Development Corporation (Frank H. McCourt, Jr., president). On the same day, it also purchased 169 Beacon, 171 Beacon, and 119 Marlborough. On February 7, 1980, Modern Continental Enterprises, Inc., purchased 136-138 Beacon from Broderick Development. In July of 1980, Modern Continental Enterprises applied for (and subsequently received) permission to combine the two properties and to remodel them into eight apartments (four in each building). It also applied to build a seven car garage and deck at the rear of the building, which was denied. Modern Continental Enterprises subsequently amended its plans to increase the number of units to twelve, and then to reduce the number to ten. 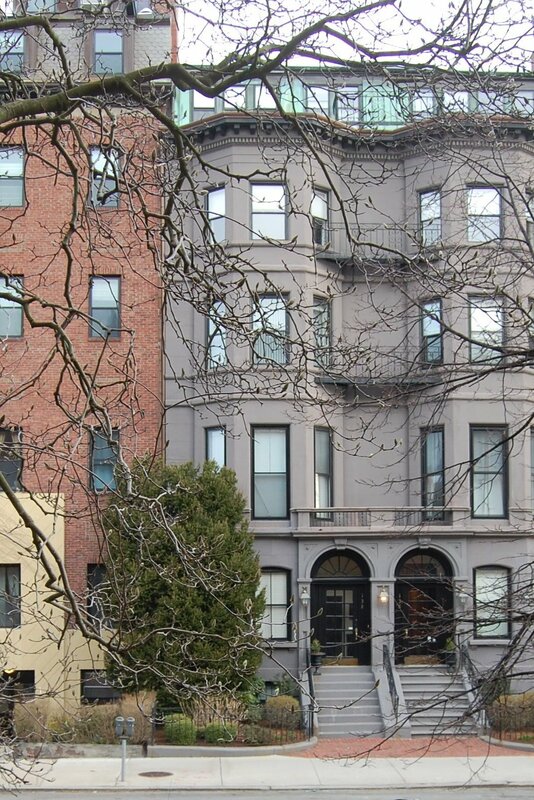 On July 21, 1982, Modern Continental Enterprises converted the combined buildings into ten condominium units, the 136-138 Beacon Street Condominium.